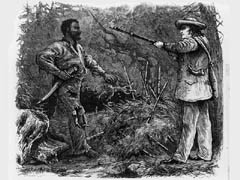 click image for close-up This image portrays the discovery of Nat Turner. After state and federal troops dispersed Turner's forces, he escaped and hid in several different places near the farm where he had been a slave. His hiding place was discovered by a dog, and on October 30 he was captured.